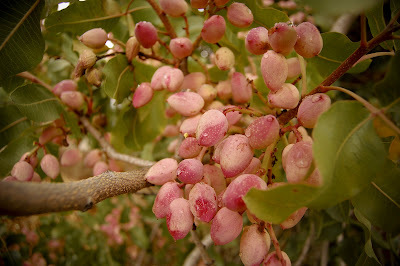 These are some photos I took of a Pistachio tree at a friends house in Paso Robles. Notice on this picture how the outer skin is beginning to break on a couple of the pistachios...that is a sign that they're ready because the shell underneath is also cracked open. Fresh pistachios are actually quite good. There's a hint of sweetness to them.